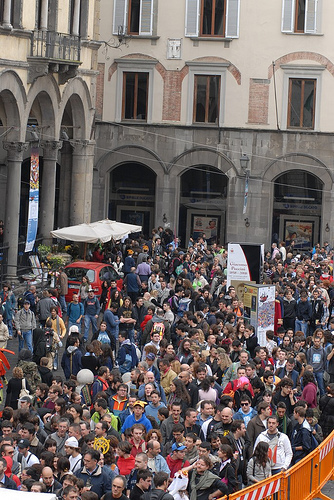 As you may know, Lucca Comics and Games is one of the biggest comics conventions in Europe. The event takes place every year in Lucca, a wonderful town in Tuscany, in the four days between the end of October and the beginning of November. In recent years a big renewal has occurred in its organisation. Before the renewal, the convention used to take place twice a year (April and November); but several reasons led the organizing committee (actually, a true small company, with its managers, think tank, employees, administration, staff, collaborators) to choose just one season of the year, in Autumn. The most apparent point of this renewal is the different location of the convention itself: not any longer outside the ancient walls of the old town, in the area of the sport buildings and facilities, but in the very heart of the town. That is, hosted in the main old squares (the pavillions with the publishers), in the rich and magnificient ancient buildings (hosting interesting conferences, encounters with authors etc. ), in some wonderful churches temporarily turned into comic art galleries. The most important aspect of this new way of organizing the event is, though—and at least from the tourist’s, and above all from the non-Italian tourist’s point of view—the deep relation with the urban fabric. 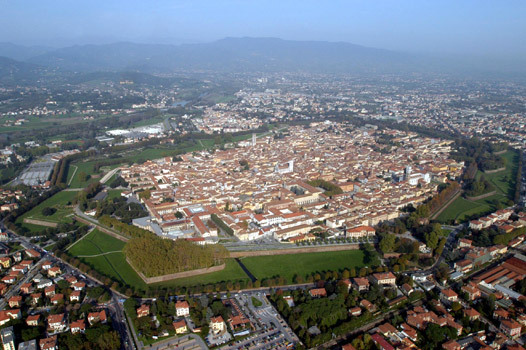 Lucca becomes for four days a “comicstown” and, of course, of comics readers, authors, publishers. Somewhat like Angoulême, even though the latter is much more a festival strictu sensu than a comics convention. We could say that Lucca has something of the San Diego Comicon and something of the festival of Angoulême. Without forgetting something of the festival of Annecy (devoted to animation), if anything because one of the organizing directors, Giovanni Russo, is a habitué of Annecy and from there he must have (well) learnt something important about how to plan and give life to an effective festival taking place in a little and artistically rich town. Many, many things have happened this year at Lucca Comics and Games (from now on, just Lucca Comics: I am not going to talk about the “Games” part, which is very interesting, but does not fit very much with this journal). So many that I shall devote to this convention a series of posts. This, because speaking about what happens at Lucca Comics means speaking about comics in Italy. Therefore the subjects of my posts will have, I hope, a general validity about the current situation in Italian comics. Of course I will refer to those themes which I find interesting enough for the international audience of The Comics Journal, hence the choice and evaluations will be strictly personal. The image above, apart being a divertissement (this is a blog, after all), suggests that Lucca is a big event where not just comics are involved: like many other conventions (e.g. San Diego), but at the same time unlike other important events (i.e. Angoulême), cosplay, video games, role-playing games, even music are also at the center of the stage. Of some of these subjects, I will talk in other posts. In the first comment about Lucca Comics and comics in Italy (which I will post in some days), I would like to talk about the part of Lucca Comics in which I was directly involved this year. I was one of the jury members for the “Gran Guinigi” awards (the “Oscars” of comics in Italy). And, as you can imagine, from this perspective I could appreciate almost the whole comics production in Italy of 2009-2010. So, arrivederci in some days for part 1. This entry was posted on Wednesday, November 3rd, 2010 at 6:42 am	and is filed under Blog, International, Italy, News.